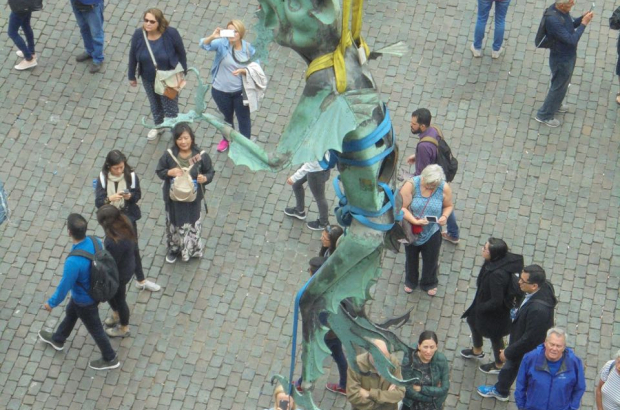 The devil got stuck trying to leave Brussels city hall on Wednesday morning - as a delicate removals operation did not quite go to plan. A 15th-century weathervane depicting Saint Michael defeating the devil was moved across the Grand-Place to the Museum of the City of Brussels for an upcoming exhibition. But moving a 600-year-old five-metre saint slaying a two-metre devil is not easy. The saint's parts were separated but the devil is in one piece and the window was too small. Finally a larger window on the side of the city hall was used and after over an hour the devil made his appearance, was lowered gently to the ground, loaded on to a truck trailer and then gently raised to the balcony of the Maison du Roi where it was joined by the pieces of Saint Michael. Most of us are not aware that the weathervane at the top of the city hall spire is a copy. The last time the original was restored, more than 20 years ago, it was replaced by a copy. The original was housed in the tower itself, until it was moved on Wednesday morning. City historian Roel Jacobs said: "The Grand-Place is 20m above sea level, the cathedral is at 40m and the Palace of the Dukes of Burgundy is at 60m. "Saint Michael is the patron saint of the city, and the city elite in the 15th century built the city hall, the towers of the cathedral and the Aula Magna of the palace with their funds. "And to show their ascendancy over lord and religion, they built the tower of city hall so tall that the weathervane of Saint Michael would be higher than even the palace." The weathervane will be visible as part of the Grand Place To Be, an exhibition celebrating the 20th anniversary of the square's inclusion on the Unesco world heritage list. The exhibition will run from 4 October until the end of December 2019.